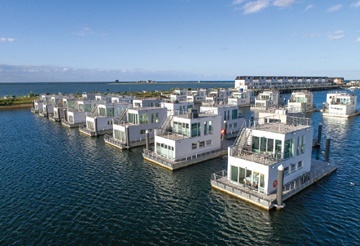 Each Olpenitz home has land registration due to the fact that Clement’s patented technical solution makes floating structures ‘foundations’ with common floating access and connection to the shore. By establishing the homes as acknowledged real estate, financing options for buyers are easier to obtain. Every house measures 100m² (1,076ft²) and boasts a large roof terrace with exceptional views out to sea. Vacuum drainage, energy systems (including heat recovery) and drinking water supply are completely integrated in the concrete foundations. Well protected alongside berths can accommodate boats up to 18m (59ft) in length.